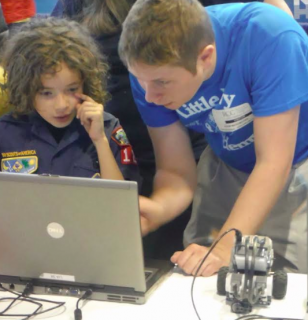 Now that he’s built his mobile robot, it’s time for a quick chat with a Little Ivy Academy camp counselor while this fair-goer programs his bot to make its moves. You and your family are invited to join us this Saturday for an awesome day of hands-on science & technology fun at STEAM Expo ’17.
. . . just as kids ages 6-14 do in our summer camps programs at campuses in the Rockland County/Pascack Valley & Ridgewood/Glen Rock, NJ areas! 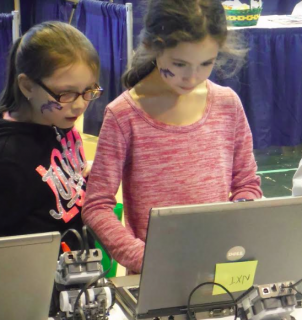 These girls are fascinated by the possibilities while coding their mobile robot’s moves, just moments before launching it into action at a recent fair. Catch a new spin on real 21st Century STEAM fun (Science, Technology, Engineering, Arts & Math) when you join us this Saturday, March 4 from 11 am – 3 pm at Suffern High School, 49 Viola Road, Suffern. Admission is free! For directions and additional information about STEAM Expo ’17, visit www.littleivyacademy.com/steamexpo.html, or contact Little Ivy Academy’s director, Erich Bassler, by phone at 201-444-8400 or by e-mail at info@littleivyacademy.com. Now in its 2nd year, STEAM Expo ’17 also will spark your child’s imagination and curiosity with a range of demonstrations and hands-on activities, including the Science Circus, a live, interactive show presented by Liberty Science Center; the Challenger Center’s travelling planetarium; and more!